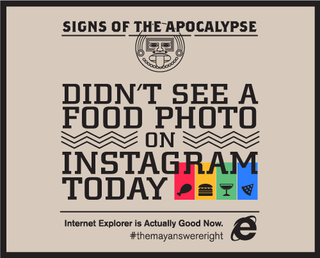 In another excellent ad for Internet Explorer 10, IE pokes fun of itself saying that the sign of apocalypse is here because Internet Explorer 10 is actually good now. This follows up their hilarious video ad which showed Internet trolls saying IE10 sucked... less. What a hot streak of hilarious self deprecating humor! This whole #themayanswereright IE ad can keep going too (well for like a day). IE is also using the tagline to poke fun of Instagram and laugh at the Internet. I've gotta say, I would have never ever considered using IE10 but after seeing Internet Explorer acknowledge its own sucktitude, I may give it a try. MAYBE.